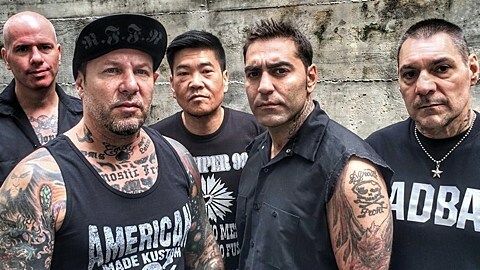 NYHC legends Agnostic Front are releasing their eleventh album, The American Dream Died, on April 7 via Nuclear Blast. They made it with a little help from their friends: Madball‘s Freddy Cricien produced and also appears on the record, as does H2O‘s Toby Morse, Sick of It All‘s Lou Koller, and former Agnostic Front/Madball member Matt Henderson. Get a taste of the album from the video for “Police Violence” and an LP trailer, below. Agnostic Front are celebrating the album with two release shows at Bowery Electric: one on April 24 which is sold out, and another on April 25 which goes on sale today (3/27) at 10 AM. 4/24 is with The Mob, Urban Waste and DJ Sid; and 4/25 is an all ages matinee with Razorheads, Pure Disgust and Ache. Agnostic Front also play Kirk Hammett’s Fear FestEvil and have a handful of other shows coming up too. All dates are listed, with those videos, below. H2O have four NYC shows coming up. Sick Of It All and Madball both play NYC’s Black N Blue Bowl.